Nine hours after a spectacular launch failure that destroyed a U.S. supply ship bound for the International Space Station, a Russian Progress cargo craft blasted off from Kazakhstan Wednesday and successfully delivered 5,793 pounds of rocket fuel, water, air, crew supplies and other equipment to the orbital lab complex. The Progress M-25M/57P spacecraft, mounted atop an upgraded Soyuz-2.1a rocket making its first flight, took off from the Baikonur Cosmodrome at 3:09:43 a.m. EDT (1:09 p.m. local time) and quickly climbed away through a cloudless blue sky on an easterly trajectory setting up a six-hour four-orbit rendezvous with the space station. The Soyuz booster, taking off from the same pad used by cosmonaut Yuri Gagarin at the dawn of the space age, featured a new digital flight computer and followed a slightly different trajectory, according to RussianSpaceWeb.com, allowing the Progress cargo ship to carry about 660 pounds of additional cargo compared to earlier versions of the rocket. The ascent appeared to go smoothly and roughly nine minutes after liftoff, the Progress was released to fly on its own. A few moments after that, its two solar panels and navigation antennas deployed as planned. "The crew feels wonderful, and we're ready for the timelined activities," Expedition 41 commander Maxim Suraev radioed flight controllers in Moscow during a morning planning conference. "So, how's that Progress doing?" "Good morning, everybody, this is Moscow," a flight controller replied. "The Progress is doing splendid. ... All the systems are preforming nominal, the antennas are deployed, and so all we've got to do is wait, because it's coming your way today." "That's a good thing," Suraev said. Over the next six hours -- four orbits -- the Progress spacecraft carried out a series of carefully planned rocket firings to catch up with the International Space Station, gliding to a docking at the Pirs module at 9:08 a.m. as the lab complex sailed 261 miles above the Atlantic Ocean. 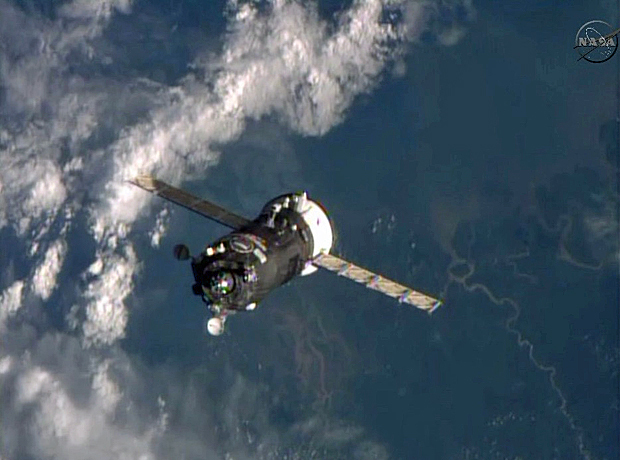 "Free drift is confirmed," Suraev radioed as the docking mechanisms engaged. "Congratulations to the entire flight control team." "Thank you, Max, congratulations on the arrival of yet another cargo vehicle," a flight controller replied. "And we'll continue performing our steps." "Right, no time to relax right now," Suraev agreed. "We'll keep going." The Progress and its cargo are a welcome addition for the station's six-member crew. The spacecraft is loaded with 1,940 pounds of propellant, much of it reserved for space station orbit adjustment maneuvers, 926 pounds of water, 105 pounds of oxygen and air and 2,822 pounds of dry cargo. While the Progress was closing in on the space station, ground crews at the Mid-Atlantic Regional Spaceport at Wallops Island, Va., expected to be getting their first good look at the havoc caused by the dramatic failure of an Orbital Sciences Antares rocket that exploded Tuesday evening seconds after launch. Destroyed in the mishap was a commercial Cygnus cargo ship loaded with some 5,050 pounds of supplies, experiment hardware and other equipment. It's not yet known what caused the dramatic failure. It was the first in five flights by an Antares and the first station program launch failure since a Progress was destroyed after a third stage malfunction in August 2011 that sent 2.9 tons of space station supplies and equipment crashing back to Earth. Despite the Antares failure, NASA officials say the space station is flush with supplies, enough to keep the crew operating for several months even if no more resupply flights were launched. "We manage the station to protect for just such an event should it occur," Mike Suffredini, NASA's space station program manager, told reporters late Tuesday. "We keep logistics on board the ISS to protect us for about four to six months in the event other logistics vehicles can't make it to ISS. So in fact, our logistics on board today, if no other spacecraft showed up, takes us well into next year. So from a consumables standpoint, we're in good shape." Cargo aboard the Progress and a SpaceX Dragon cargo ship scheduled for launch Dec. 9 will boost those reserves even more.